In the picture above, north is at the top and the image covers 30.1 x 37.6 degrees. Image centre is located at 06:59:25.0, +24:22:57 (H:M:S, D:M:S, J2000) Astrometric data from Astrometry.net. Gemini (the Twins) is easily visualised as two figures holding hands, their heads represented by the stars Castor and Pollux. 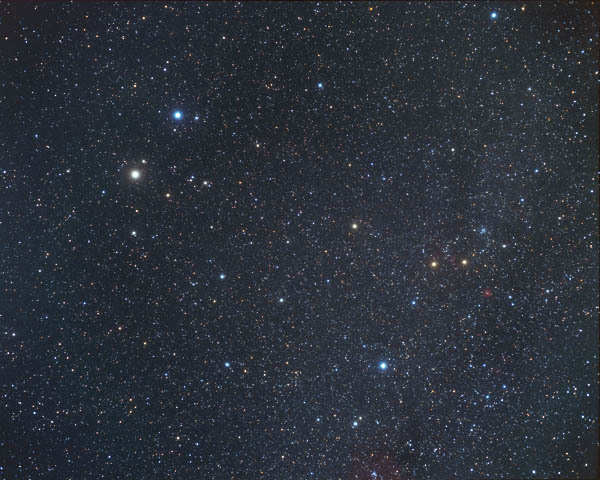 These stars represent identical twins that have an interesting (and disputed) genetic history, in that Castor was a mortal while Pollux was not. However, the twins were close though Castor grew up to be a horseman and warrior while Pollux became a pugilist. The constellation itself is an ancient zodiacal construction, with a rich mythology vanishing in the mists of time. Because of its two main stars, Gemini is easy to find in the northern part of the southern summer sky. It is seen north east of Orion and at about the same declination of the Hyades and Pleiades to the west of Orion. It is from the direction of Gemini (near Castor) that annual Geminid meteor showers radiate, around December 14. Alhena (γ Gem), Alzir, (ξ Gem), Castor (α Gem), Mebsuta (ε Gem), Pollux (β Gem), Procyon (α Gem), Propus (η Gem), Tejat Posterior, (μ Gem), Wasat (δ Gem). Constellations adjoining Gemini: Auriga, Cancer, Canis Minor Lynx, Monoceros, Orion, Taurus.